On Sept. 6, 2017, French Defense Minister Florence Parly announced that France’s MQ-9 Reaper drones — used for surveillance and reconnaissance purposes only — would be armed. 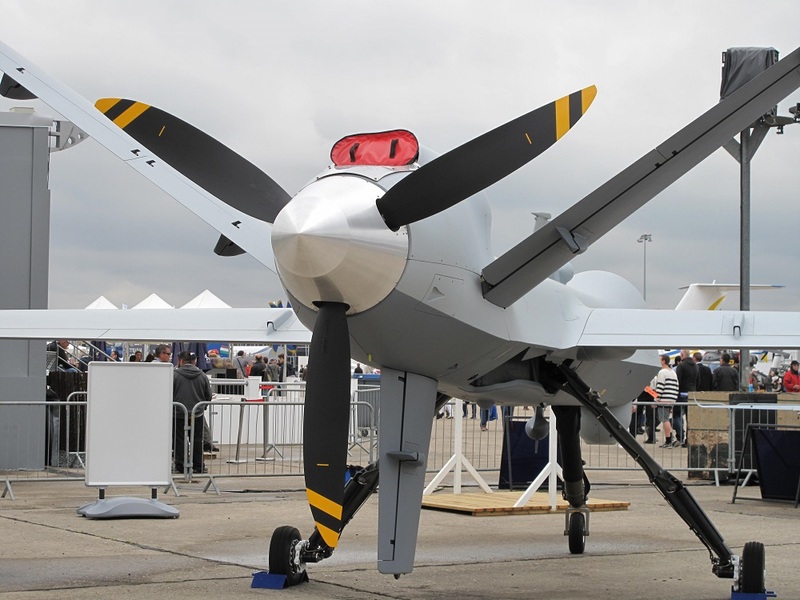 The soon-to-be lethal drones will give France “endurance, discretion, surveillance, and a strike capability at the right place and the right time,” Parly said. Add the French military, which has sought to boost its numbers of drones, as another member of the growing list of armed drone operators in the world. In practice, this most likely means drones helping the French Air Force conduct combat sorties in the Sahel region in Africa, where France has 4,000 troops deployed to counter Islamist insurgents. Pres. Emmanuel Macron has said there are no plans to pull them out as a new multi-national force of soldiers from Burkina Faso, Chad, Mali, Mauritania and Niger takes on a larger role. By the time Macron leaves office, he’ll have presided over the arming of France’s drone fleet. “Beyond our borders, the enemy is more furtive, more mobile, disappears into the vast Sahel desert and dissimulates himself amidst the civilian population,” Parly said. France’s drone force is small. Five of its six Reapers are at Base Aérienne 101 in Niamey, Niger, operating with Escadron de Drone 1/33 Belfort. Another remains back at Cognac in western France. That should change in the years ahead, with six more Reapers arriving in 2019. By then, the current six will receive small, U.S.-made Hellfire air-to-ground missiles, with the upcoming six to receive their weapons by 2020. It’s not clear if France will keep buying Hellfires or seek to equip them with a European — or more specifically French-made — weapon. In any case, the Reaper is designed to carry up to 3,750 pounds of bombs and missiles, making the drone more than capable of equipping France’s precision-guided “Hammer” bombs. Arming drones is slightly out of character for the budget-conscious French military, which has learned to fight in a lean style. In recent operations in the Sahel, the U.S. Air Force provided drone strikes — although to a lesser extent than in Iraq, Syria and Afghanistan. French military officers are wary of copying Americans, who fight in a different manner. Officers, having been around their American counterparts in Afghanistan, have “expressed concern that the French Army had learned some bad lessons … with regard to fighting ‘American-style warfare’ in the sense that infantrymen worked in close conjunction with drones, satellites, and aircraft providing close air support,” stated a 2014 study which the Rand Corporation — a private research organization — prepared for the U.S. Army. One of the more curious ways the French military has learned to do more with less is by training eagles to intercept drones that terrorists could arm with small bombs. It almost goes without saying that French officers would prefer more resources — and more drones, too. France’s 2013 intervention in Mali counted on few intelligence-gathering assets, entailing a higher degree of risk for soldiers on the ground. Before the Reapers arrived, French troops in the Sahel flew their tiny number of older Harfang drones day and night. Those machines are now reserved for homeland surveillance duties in France itself.